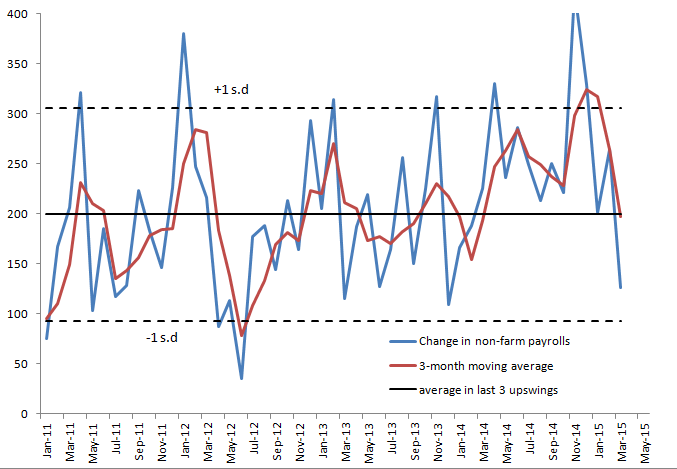 +150K: the cumulative monthly consensus forecast error on NFP over the past 6 months – ie the 119K miss this month is more than offset by upside misses over the preceding months. The weaker outturn for March is far from being a statistical outlier. Indeed the strong prints November and December were far more extreme. But given the BLS put a 90% confidence interval of +/- 105K on their monthly change estimates, it could reasonably by anywhere between +231K and +21K. So for now, I am content that while growth likely eased back in Q1 (current tracking estimates are around 1% saar) and employment growth also slowed, that these do not materially change the outlook, or the timing of the first Fed hike. I am still of the view that they start the process of normalisation in September (with June still an outside chance).